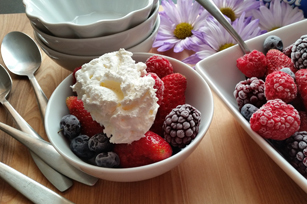 A blend of fresh and frozen berries topped with COOL WHIP Whipped Topping make this one of the simplest and most refreshing desserts imaginable. Ask your children to clean the strawberries with running water and take off the stem. Then open the bag of frozen berries using kitchen scissors and pour the content in a bowl along with the fresh strawberries. Using a spoon allow them to serve four portions of the fruit on four small dessert bowls and top the fruit with 2 Tbsp of whipped topping each. Bring the dessert to the table and enjoy. Don’t forget to praise the kiddos in charge of the great looking dessert. You can use any kind of frozen fruit. Watch out for sharp knives or scissors. Help your children while cutting or slicing or otherwise take charge of this task to avoid injuries.